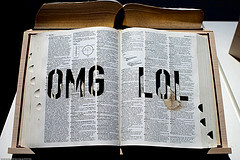 62 Common Internet & Texting Acronyms. Please note that even though the acronyms below are written in ALL CAPS, it’s not necessary to use the capital letters, and most people tend to mix upper- and lowercase depending on the situation anyhow. Keep in mind that if you do use caps for the acronyms themselves it’s generally not considered poor netiquette even though typing in ALL CAPS is usually read as “shouting”. What was that movie abt? ADN the printer will be done with my reports. AFAIK the info is correct. Wife just got home. AFK for a bit to say “hi” to her. I’ll be there ASA I’m done with work. Can’t chat, I’m busy ATM. I love chocolate b/c it’s delicious. What happened b4 it started raining? Just got 5 new messages on my BB. Hold on, I need to bio. BTW your sister called earlier. Let’s have a F2F meeting about the proposal. You can find the answers in the FAQ. I like that color, FWIW. Two more signups and we’re G2G. GL with meeting your boyfriend’s parents tonight. I’m going to bed. GN. Sewing buttons is something that’s GTK how to do. IANAL but it seems like he’s within his legal rights. I put it together IAW the instructions that came with it. IDK the answer to that. You got me the DVD? ILU! IMHO that color looks terrible. Bob? Yeah, he’s not just an Internet friend. I know him IRL. I’m running 20 minutes behind. JK I’m right around the corner. I love my new wireless KBD. Don’t make it complicated. KISS. It was nice seeing you again. KIT! Your text made me actually LOL! It’s time to change the MOTD in the break room. Even if she did say that, I suggest you MYOB and stay out of it. Those instructions are N/A to this test. I heard him say it, but NC. I’m keeping my mouth shut. It’ll be NP to finish this within the hour. Don’t open that website in the office, it’s NSFW. Did you find my pen? Oh wait, NVM. I found it. OMG that new haircut looks so good on you! I just left work and I’m OMW to meet you. That new car is OOS. OTOH you may be right about this. From my POV there was nothing there. Next time RTFM that came with the printer before you open it up! RU going to be at the next meeting? Tina is bringing her SO to the restaurant. He uses TLAs all the time in his messages. She told us all about her surgery last week. TMI! I need to go to sleep now. TTYL. UR car’s alarm is going off. What’s the URL to the website you told me about earlier? W8 for me before you go. W/E you want to eat for lunch is fine with me. It worked on my computer, but YMMV. WRT your meeting request, I think that’s fine. My mouse just stopped working WTH? I’m really impressed with your writing skills as well as with the layout on your weblog. Is this a paid theme or did you modify it yourself? Anyway keep up the nice quality writing, it is rare to see a nice blog like this one these days.